What do you do when you wake up at sunrise on a gorgeous weekend morning? Go running! No… Wait! That was my “old self” from ten years ago answering. My “today self” pushes Ariel out of bed while whining about how tired I am, begging him to get up with the kids. Lucky for me, he often does this even before my whining begins. He knows I’m not a pretty person to be around when I’m tired. Strangely, when we woke at 6 am on Saturday after an interrupted night’s sleep, instead of responding “yes!” to Ariel’s offer to get up with the kids, that enthusiastic morning person buried beneath my tired Mommy self somehow clawed her way to the front and I found myself suggesting we all get up and go for a run. Two days earlier, I’d attempted my first run since early in my pregnancy 18 months ago. I’d tried alternating minutes of walking and jogging, totaling about 2 miles and felt great, both physically and mentally. Running in the morning on the trail overlooking the Mediterranean Sea used to be one of my favorite things to do here so I was enthusiastic about continuing this tradition with all members of my family. The details of getting us out the door (who needs a snack? do you need to use the bathroom? where is Eitan’s hat? where’s my water bottle?) were more complicated than they should have been and it was well past sunrise before we were on our way. Once outside and halfway down the block, Aviv announced that he needed to go potty. So Ariel took him back into the house and I continued my warm-up walk toward the water with Eitan in the running stroller. Once to the path, I began a slow jog against the flow of florescent-clad runners who were already on their way home and felt an instant runner’s high. The boys caught up with us in no time and as I pushed the stroller, Ariel mostly dragged Aviv on his scooter. We crawled along… but everyone was happy! Toward the end of the run I asked Ariel if it wasn’t wrecking his run to be leaning over and pulling a kid along. He answered with complete sincerity “Is there anything better than holding Aviv’s hand all morning?”! Jet-lag is subsiding and we all slept until 6am when the garbage trucks woke us this morning. My philosophy is, if I have to be up at that hour I might as well start the day with a little exercise followed by a tasty breakfast. When renting a crib I’d inquired about a running stroller and the guy actually said, “you mean for sport? We don’t have those here.” So my husband and I traded off running and chasing Baby A around the playground. The dust cloud that has been sitting over Tel Aviv the past couple of days is finally clearing. Blue sky was beginning to peek through during my run and the temperature was perfect. My legs felt heavy even though I’ve biked short distances each day and also ran two days ago. My focus for the past five weeks has been solely on violin and audition prep, so although I’ve been mentally and physically exhausted each night, the feeling was different from my usual training regime. 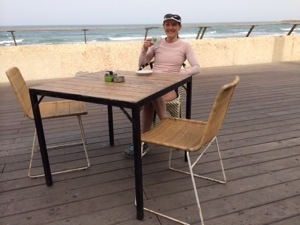 I’m excited to get into a routine of regular runs along the namal and through Ha Yarkon Park, biking to hebrew lessons and swimming at Gordon pool! For breakfast we tried a cafe which had attracted me with tempting aromas during my run. It was the most delicious meal I’ve eaten since our arrival last Thursday- and I love the food here! 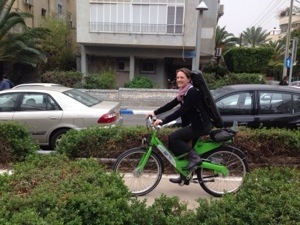 In the middle of breakfast I got a call that my placement exam at the Ulpan had been moved up an hour so I finished quickly and raced to the nearest Green Bike station. I can pick up a bike wherever I am and drop it off wherever I’m going. It’s a brilliant system and beside the severe lack of bike lanes & abundance of scary drivers, it’s the easiest way to get around here.